I have to admit, it’s been an insanely long time since I’ve signed up to run a 5K. In fact, it has probably been over 15 years (maybe even more?!??). 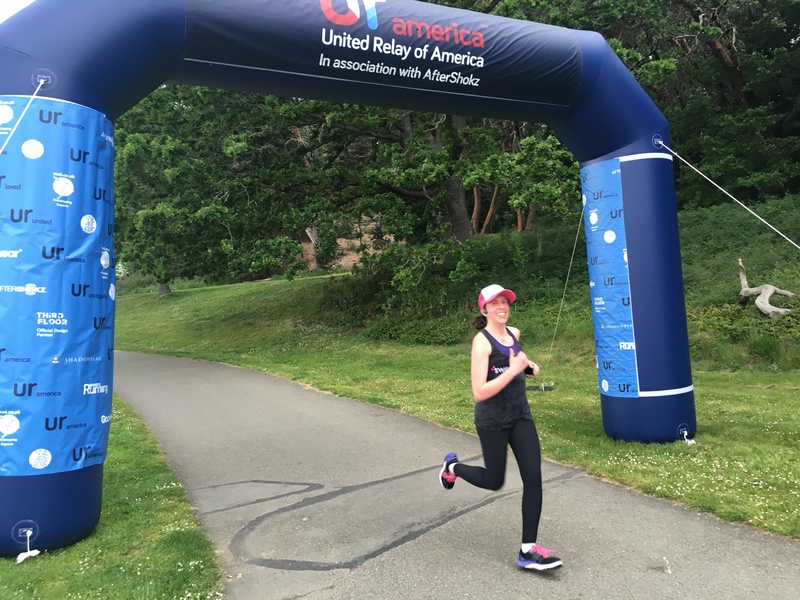 I’m sure I’ve raced a 5K distance in the middle of a relay before – but when you’re running 3-4+ times in 24 hours – it never actually feels like a 5K and I’m not sure its truly the same thing. On that note, if anyone is looking to join an ultra team for Cascade Lakes Relay in July, hit me up! Anyway, I was given the opportunity to run the first 5K leg of the United Relay with Aftershokz and my amazing #SweatPink and Flex & Flow family and knew I couldn’t pass it up. 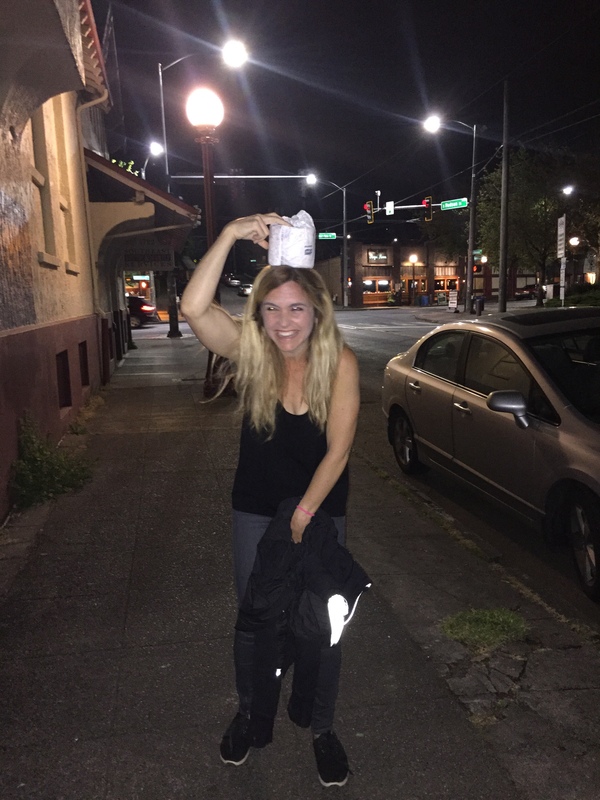 Since the start line was in Seattle on a Wednesday evening, we decided to make a girls faux weekend out of the whole thing. Roadtrip. Run. Wine. Girl time. The whole freaking shebang. 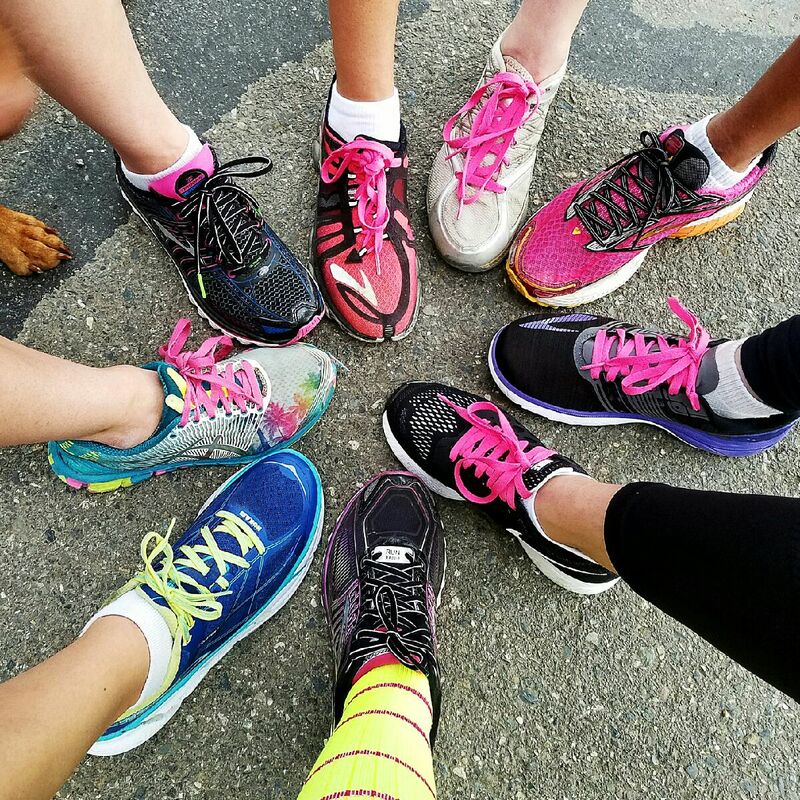 We (meaning Liz, Nicci, Jessica, Cindy and I) met up at Flex & Flow on Wednesday morning, loaded up the car – 5 ladies, one small tan dog (aka Abbie) and whole lot of #sweatpink laces, hats and FUN. 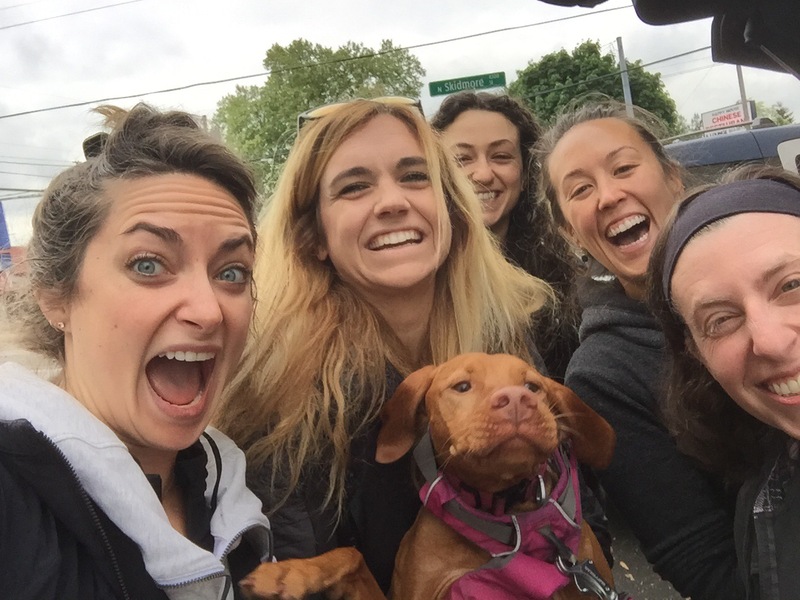 The drive was a breeze – we practically flew up to Seattle – partially because we stayed near the start line in Seward Park and were able to avoid downtown altogether and partially because there was non-stop storytelling, laughter and good tunes. 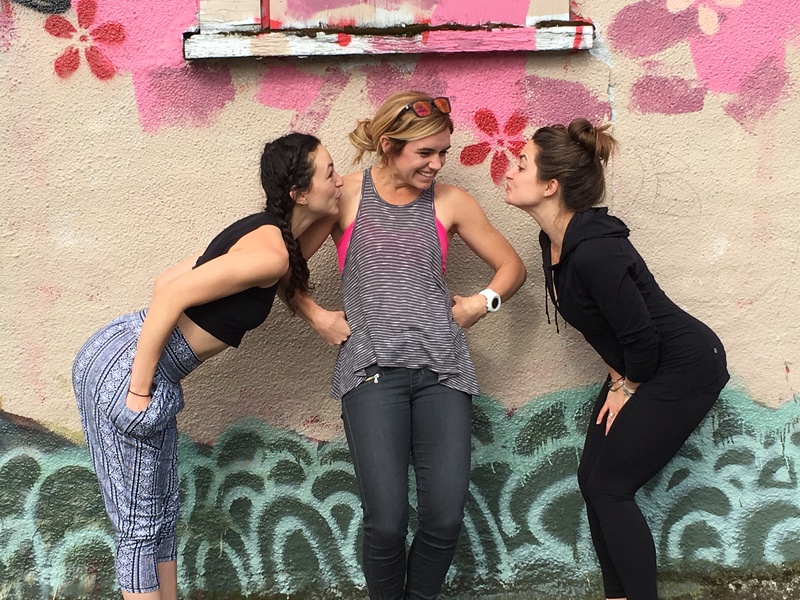 We rented the CUTEST place and did a quick exploration before heading out in search of food. We ended up eating at the Both Ways Cafe…because, well, the name…(and proximity to where we were staying – duh). Liz and I shared the veggie lentil soup and a gruyere + veggie sando (so, so, so good). And we may or may not have left with 3 cookies…. 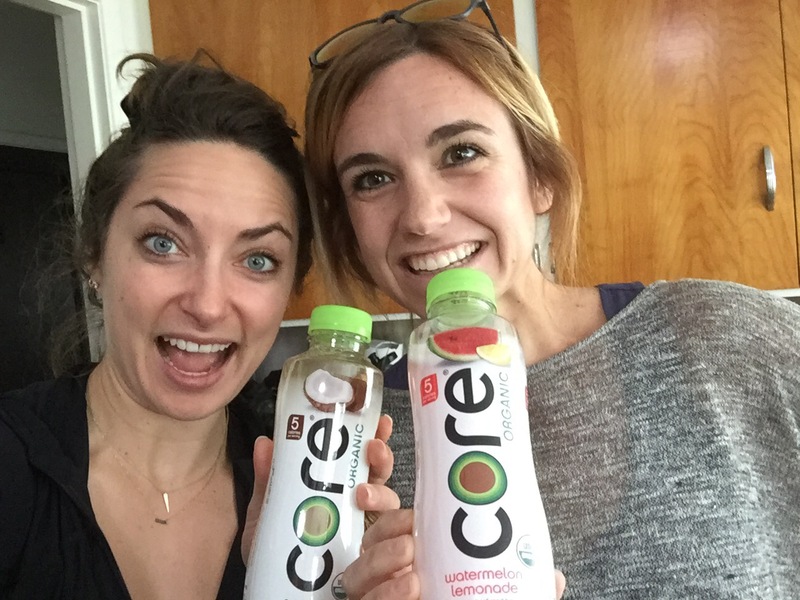 After lunch we headed back to our place to get race ready and get our hydration on with some Core (the watermelon lemonade is my absolute FAVE)….which of course also turned into a silent disco dance party on the deck…each of us dancing to our own beats wearing our new Aftershokz headphones. 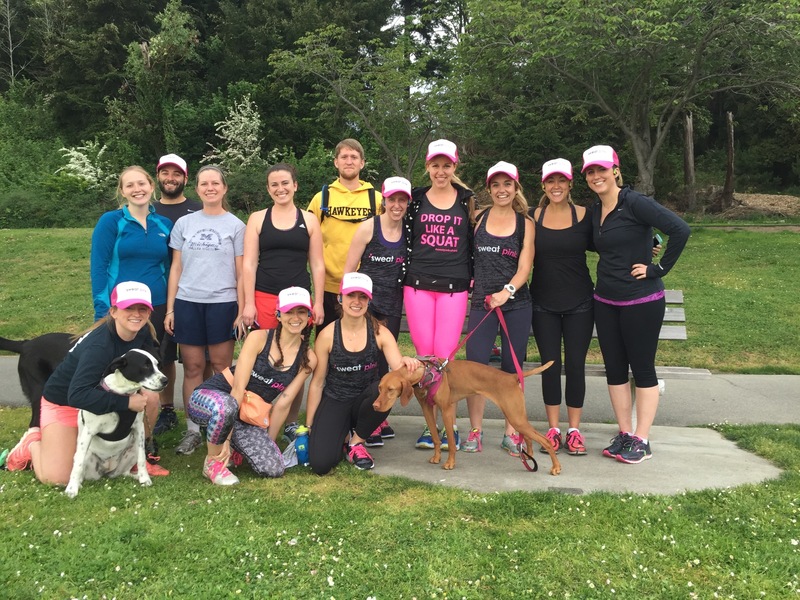 After getting all of our Sweat Pink gear on, we headed out to Seward Park. And took all the photos. 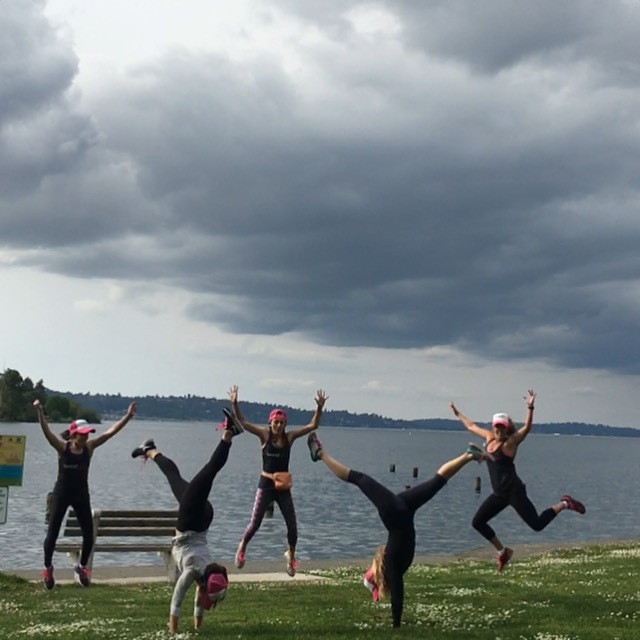 Attempting to get everyone jumping while two people are in handstand proved to be more difficult than we could have imagined…..
…plus all of our Seattle running friends, Jackie, Ben, Karli, Emily, and our proud Sweat Pink hat wearing guys! We got situated at the start line and I could already tell I was going to be running the course solo (well at least as a solo human…). There were so many ducks. Too many ducks. And Abbie was all but losing her mind. We weaved our way out of the small crowd and ended up taking the lead. 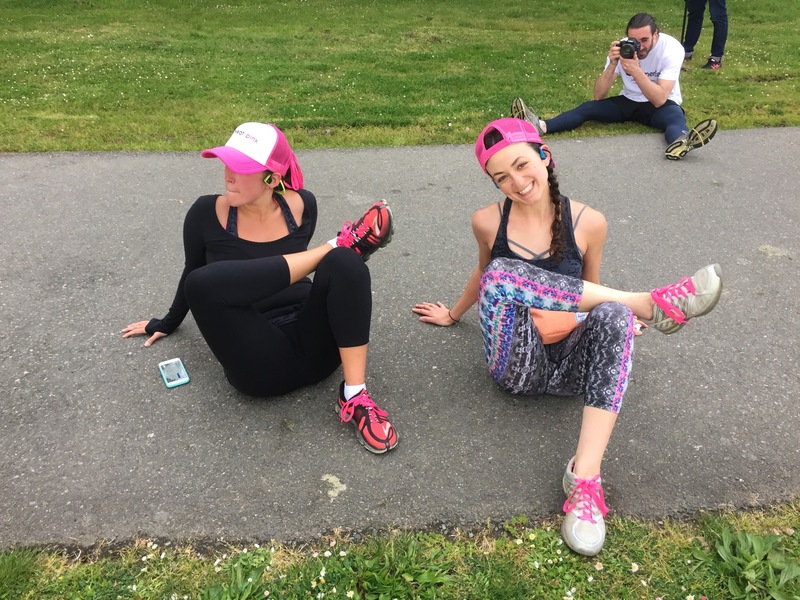 It was a beautiful run through Seward Park – water around us, lots and lots of ducks (dammit), and all kinds of people out running, biking, walking and enjoying the beautiful evening. 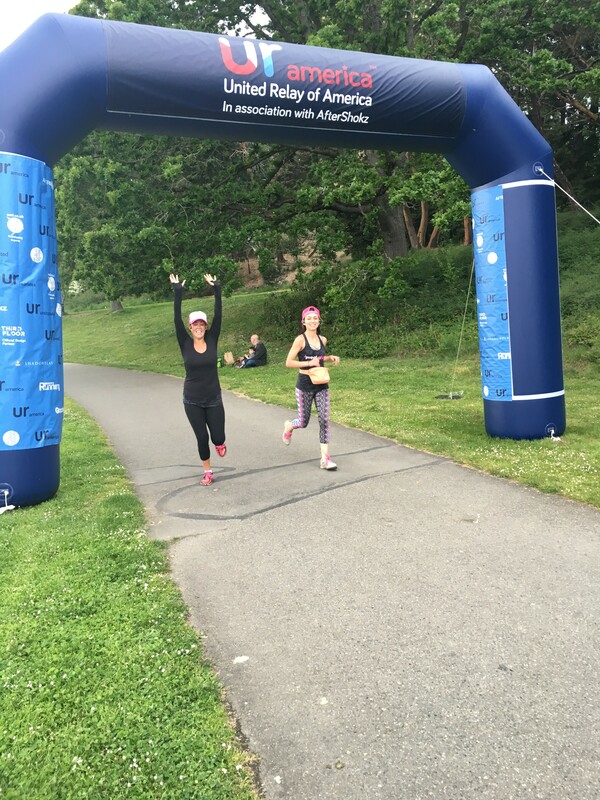 The United Relay and Aftershokz folks were at every twist and turn cheering us on and capturing some awesome race day footage (I sure hope they caught a little of Abbie’s duck fever). As I started to near what I thought might be the finish, I saw a very familiar and friendly face – CARLEEH! I was so happy to see her that I stopped dead in my tracks for a minute – and said, oh are we done? And she and the Aftershokz crew pointed me in the direction of the finish and Abbie and I bolted off. Abbie and I were the first to cross the finish line which was pretty darn cool. 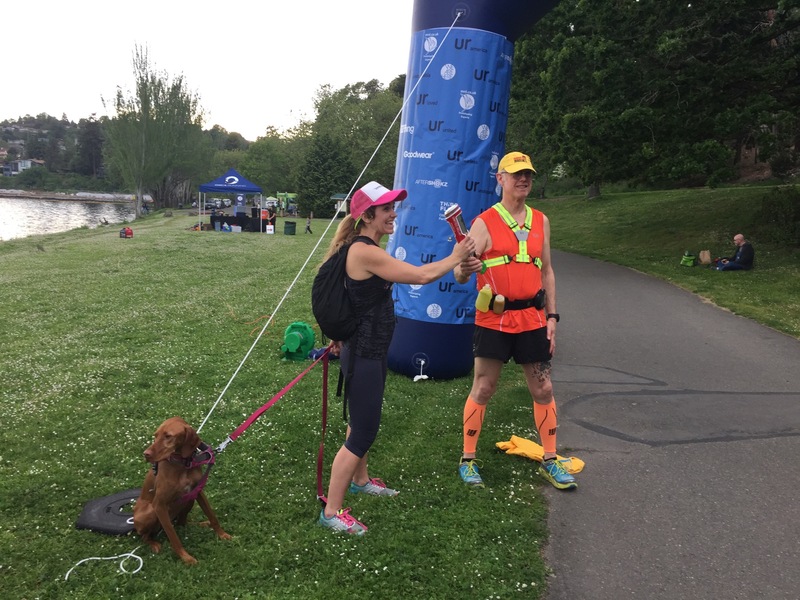 Handing off the baton to the next runner…no sleep till Brooklyn! 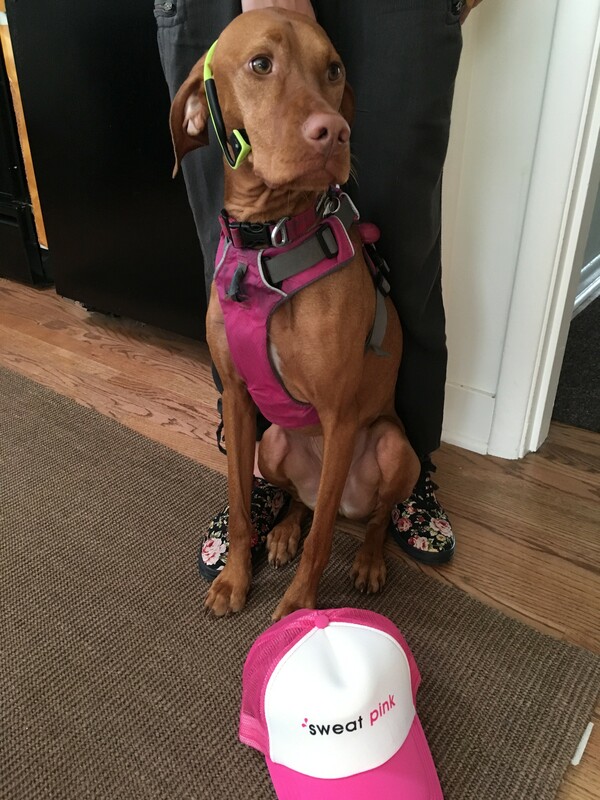 We stayed and cheered in the next runner….Cindy. Nicci and Jessica and so on and so forth. It was all smiles, all around. 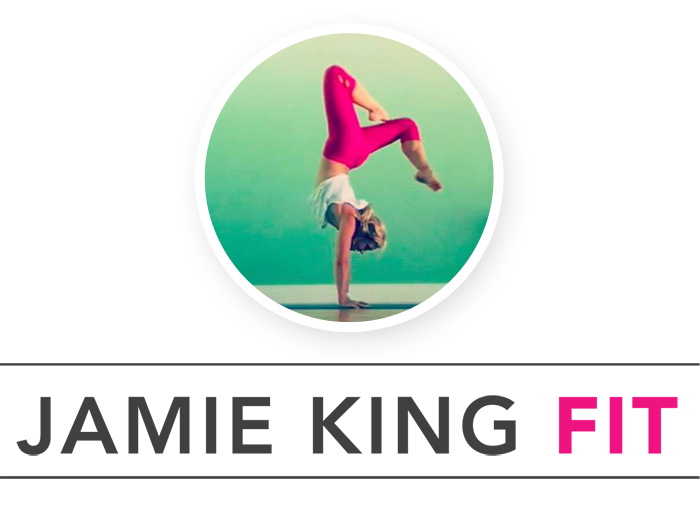 And I’m so proud of my Flex & Flow girls who weren’t so sure about the whole running thing (ahem, Jessica…). Of course once we had all crossed, we stayed to take some photos. 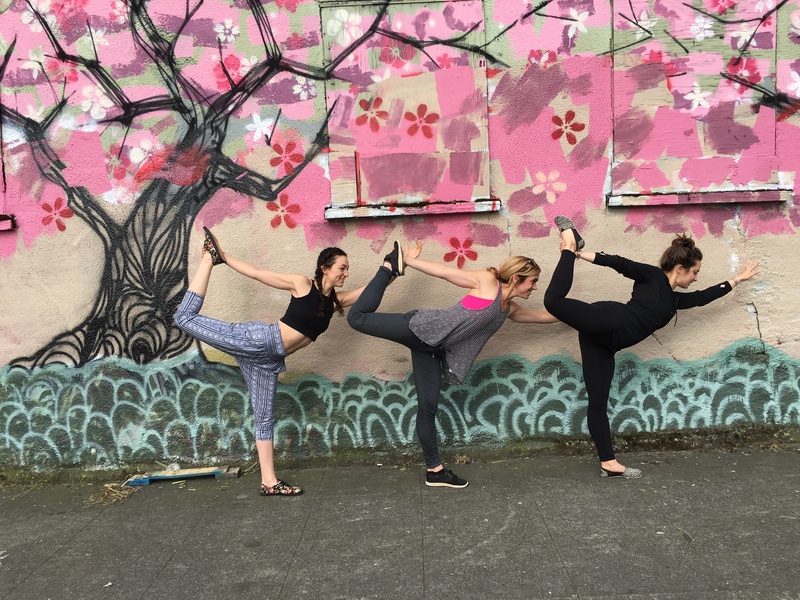 All the selfies and yoga pose fun…. And then back to our little zen retreat to freshen up, enjoy a little wine and cheese and eventually make our way to dinner. It ended up being a glorious Wednesday night FULL of wine, french fries, girl talk and ALL THE LAUGHTER and stories. I’ll leave you with this little gem. 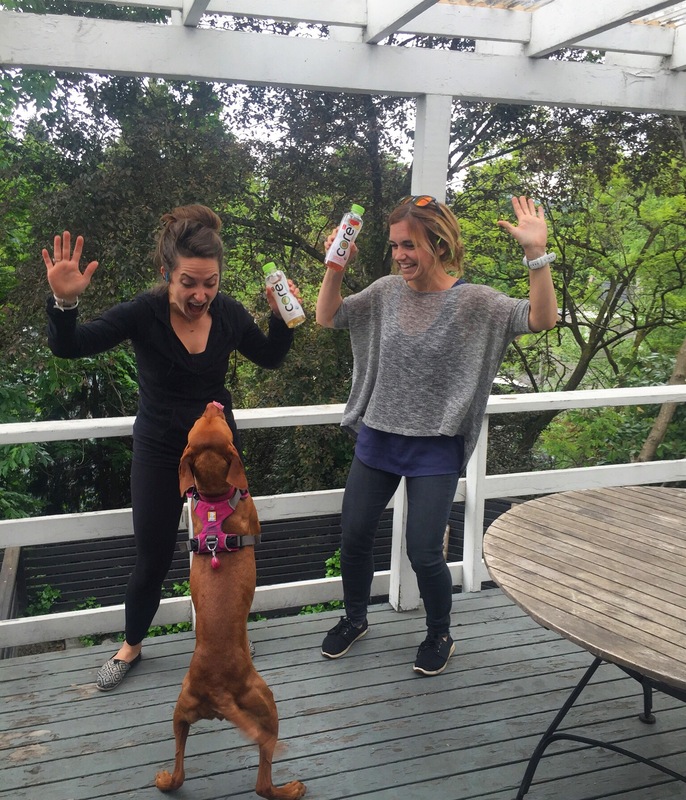 Ready, set, CAPTION! 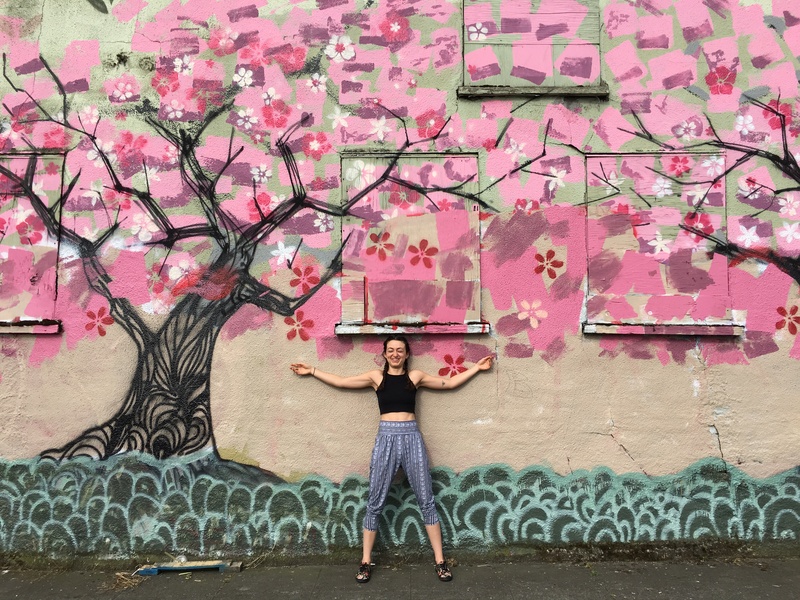 …and er, starfished for some cool murals…. 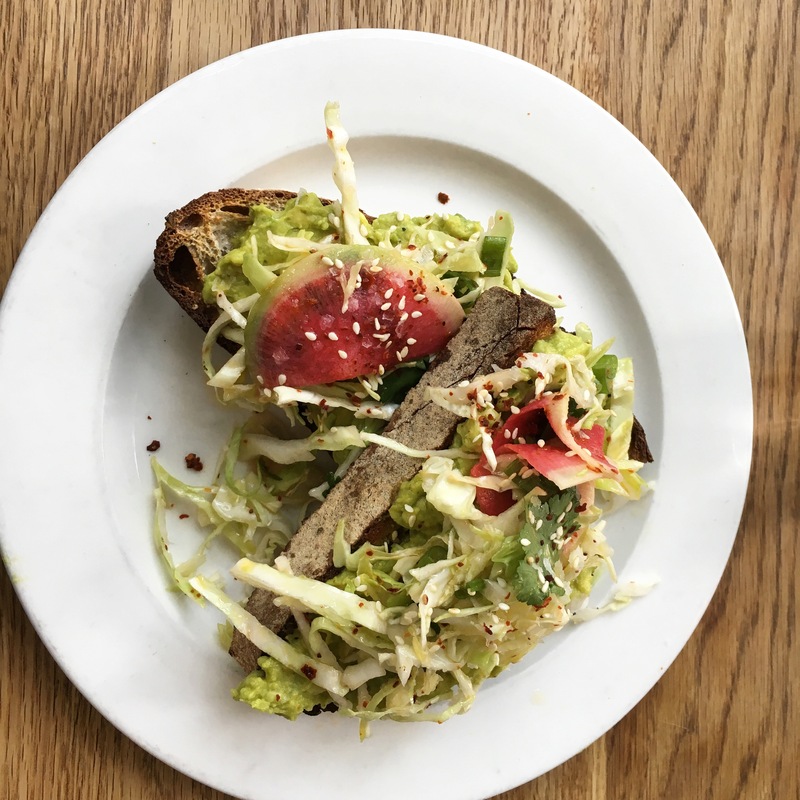 …and then eventually mosey’ed over to brunch at London Plane for the most delicious toast: curried avocado toast with cilantro, radish and cabbage . And now finally, I leave you with this little gem. Such a fun trip. Now have a happy real weekend y’all! OH and PS – if you want to run the United Relay in your own town, check out the routes and get in on the action. More info and a race registration discount here! 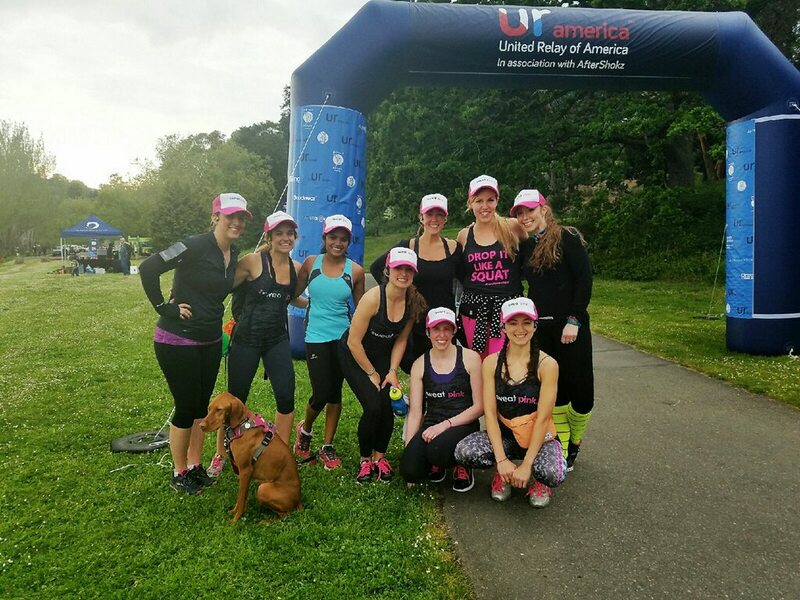 Thank you to the United Relay and Aftershokz for sponsoring the Sweat Pink and Flex & Flow runners! 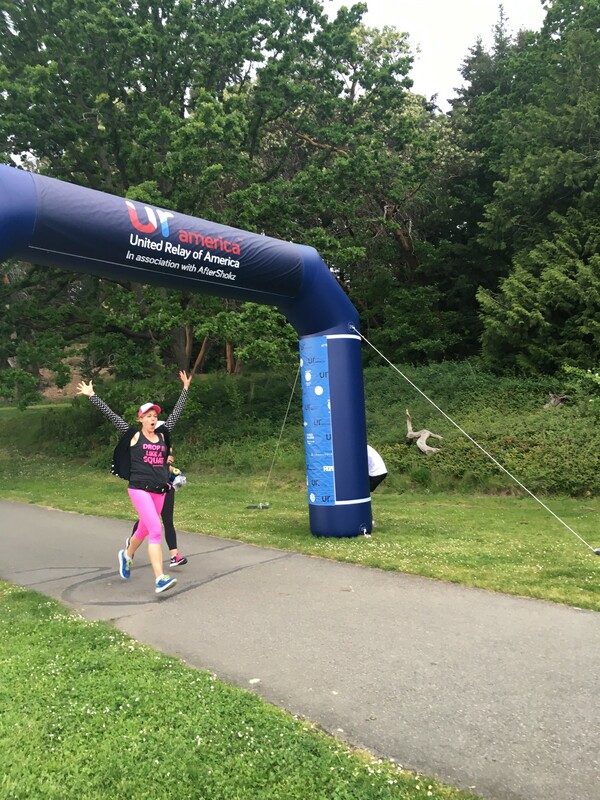 While I was given a free race entry and headphones, my words and my experience was all my own. I truly appreciate all of the brands that support the Sweat Pink community. Peanut, peanut butter...and jelly...smoothie, that is! bahahaha I hate you love you for that last gem. HAHA, I couldn’t resist. 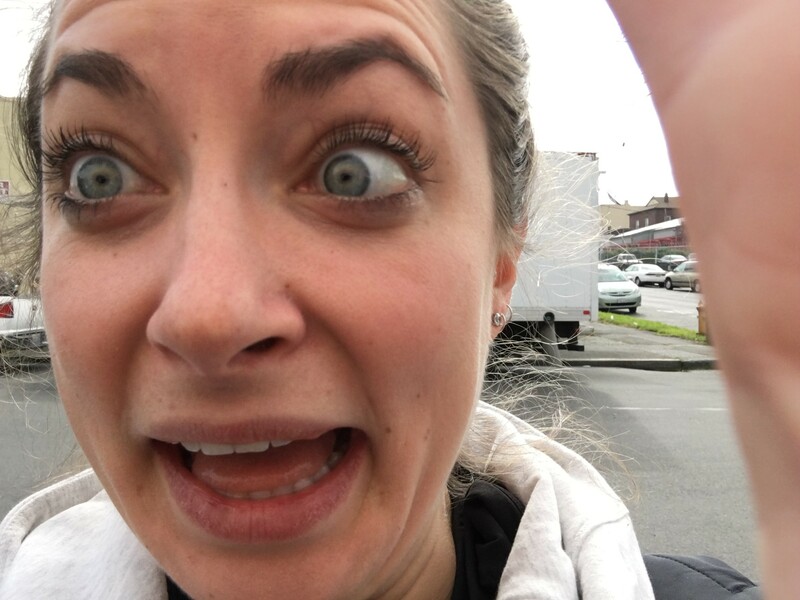 That one makes me LOL every time I open up my photos. I don’t know what it is…but I love it. SO HARD. That and Nicci’s starfish. I can’t even handle…. I signed up to do a leg in OK! oh, so exciting, can’t wait to hear how it goes!! OMG that last picture! Found it lurking in the #laughpink board on our pinterest page. haha! So ridiculous!